I have been a bad girl. A very, very bad girl. Now I know it is not PC to describe myself as a “bad girl” by virtue of the food I have consumed over my vacation, but it’s the only way I know to describe it. I have been very, very bad. But I don’t even feel guilty about it, because I am on vacation, and calories don’t count when I am on vacation. “What if they want Lucky Charms?,” I asked. I’ve taken that advice pretty much to heart, keeping my house a reasonably clean eating zone, at least Monday through Thursday. Other than the occasional quarts of frozen yogurt, you won’t find much “junk” food in my cabinets. I buy lots of organic vegetables. I eat lean meats. I can’t remember the last time I went to a bakery. Not even for a bagel. Enter vacation mode, where there are no rules. “What’s for dessert?” Mike asks me after “dinner” aboard. “Dinner” is not really “dinner” in a traditional sense. Dinner is just a very long, glorified cocktail “hour,” which usually starts at 5 PM and ends at after sundown. A few lemon vodkas on ice, mountains of local cheeses with crackers, smoked salmon with capers, feta cheese dip, hummus, perhaps a bit of Burrata (that’s the fresh mozzarella that has the creamy stuff in the middle) topped with a little olive oil. Dinner may not be traditional, but it is very yummy and quite unhealthy, and on vacation there is always dessert. “I don’t really even like fudge,” he tells me. I give myself a congratulatory laugh at such a wonderful joke, and then eat Mike’s portion of fudge in addition to my own. 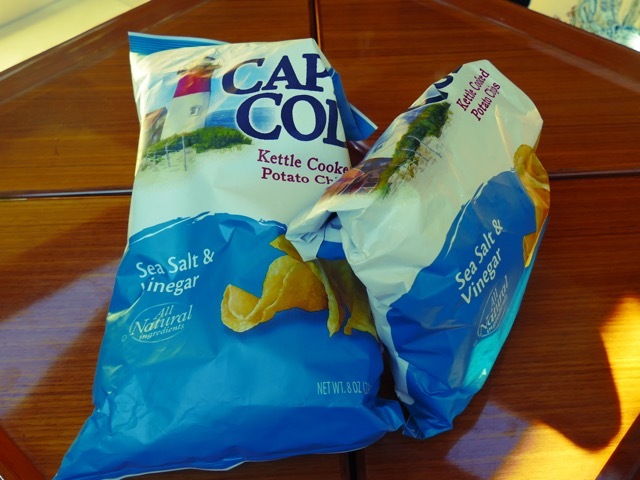 He goes for the Chips Ahoy cookies, because he is still a little boy and we can’t be on the boat without a package of Chips Ahoy, preservatives and all. 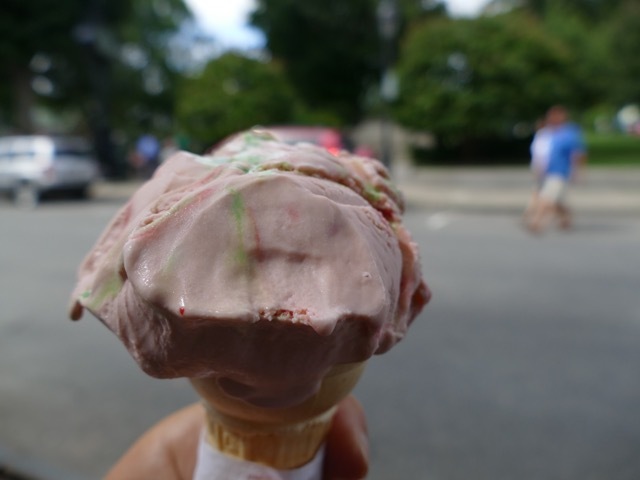 I refuse to feel guilty about a breakfast ice cream cone, because it is Shains of Maine Peppermint Stick, and it is my favorite. I refuse to feel guilty about chocolate covered almonds. Black licorice. Swedish Fish. I refuse to feel guilty about the nuts– almonds, pistachios, peanuts. I refuse to feel guilty about the onion rings, or the fries, or the butter on the baked potato. I refuse to feel guilty about the fresh cookies, the brownies, the endless flow of fresh breads, because finding the bakery, buying the goods, and eating them, has become a sort of mission. It is my observation that every island in Maine that is inhabited by more than say, 4 people, has a bakery. One day, we get fresh foccacia bread on a tiny little island, so hot out of the oven it burns our hands as we rip into it. We eat most of the loaf before we get back in the dinghy. I refuse to feel guilty about the deep fried lobster. I just can’t get over the fact that there is such a thing, and that I actually order it. I am literally hung out on Bake and Brew Lane. Eating with abandon on vacation is an awesome idea. The problem comes when your vacation is more than a week long. I’m starting not to be able to button my jeans. Would someone wheel me home? Ronna – Next year can I hire on as your cabin gal? I will row the dingy to shore and (if forced to) accompany you to Bread and Brew Street: hat means an extra set of hands for carting culinary supplies back to the ship – culinary supplies that comply with the Ronna Inverted Food Pyramid (sugar, fats, processed carbs, cream and dyes-and-chemicals-with-Latin-names-exceeding-20-letters.) Yummy! I am on my way up from Florida with the wheelbarrow – may take me a while so keep enjoying the chow-down and singlehandedly keeping the Maine economy on the up-swing till China gets its act together and the stock market calms down. HA HA, yes, perfect! Of course you can come…do you eat a lot? Dieting on vacation is against the law in many states! It is true in all the New England states. There is also an ordinance, not heavily enforced but still on the books, that one must eat at least one ice cream, one lobster and one bag of chips washed down with a local beverage while vacationing in New England during the summer at least twice a week. How else can you explain all the seasonal spots? This article made me really hungry! I’m not even on vacation!